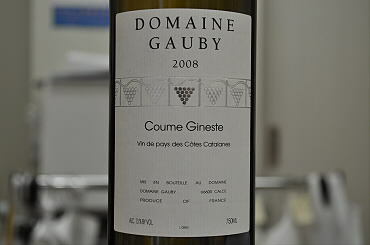 Having undergone 19 months' elevage in a large, conical oaken fermentor plus some older demi-muids, the mixed-Grenache 2008 Coume Gineste evinces an almost flor-like piquancy and toasted nuttiness on the nose, but shows the rich side of nut oils along with ripe white peach, pineapple, and citrus zests on a satin-textured, crushed stone-infused palate. This finishes with depth and resonance, a remarkable, sedate and expansive yet by no means fat or soft contrast to the corresponding Vieilles Vignes. Like that cuvee, I envision this fascinating for the better part of a decade. 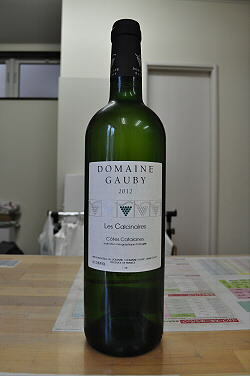 Tasted in a form sufficiently close to its final assemblage, the Gauby 2012 Cotes du Roussillon Blanc Les Calcinaire ? as usual, uniting Chardonnay, Macabeu, Grenache Gris, Muscat, and Vermentino; grown on galets roules; pressed whole-cluster; and vinified largely in tank ? delivers zesty grapefruit and lime with under-ripe yellow plum on an expansive and lushly-textured yet bright palate. Orange blossom and honeysuckle waft throughout, while a stony cantus firmus puts a floor under and thereby helps broadcast the appeal of fruit and flower. Nutty, resinous suggestions of pine nut add appeal to a lingering, at once both soothing and refreshingly stimulating finish. Expect this to delight through at least 2016. 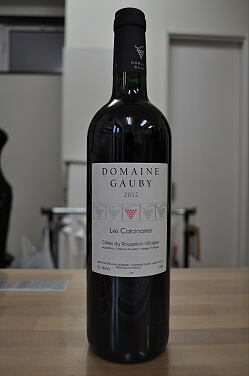 An entrancing combination of narcissus and freesia-like floral perfume with alkaline mineral intimations in the nose of Gaubys’ 2011 Cotes du Roussillon Blanc Les Calcinaire leads to a palate impression firmer and with marginally less expansive inner-mouth appeal than that of the corresponding 2012; but beautiful depth of pear and citrus fruit; a fascinating muskiness; and a straight, penetratingly persistent finish with invigorating tang of pear skin and lime rind as well as bite of radish, all render this exuberantly juicy, buoyant and invigorating cuvee a winner that will compliment a wide range of cuisine through at least 2015.